The only towel that chugs water! 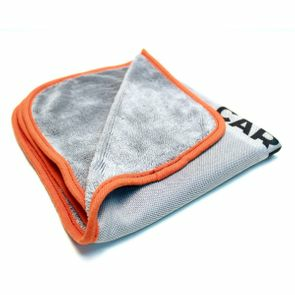 Introducing the new CarPro DHydrate Drying Towel! Designed to easily slide across the vehicles surfaces, the DHydrate towel easily pulls every drop of water off the surface leaving it spotless, shiny and ready to admire. Simply lay the towel over the surface and drag it slowly across surface and your ready to move on! DHydrate glides easily across waxed, sealed, bare, or coated surfaces leaving a streak free finish and helping to avoid swirl marks. Designed and fabricated in South Korea, DHydrate is colored light grey to easily show off any possible dirt particles to help avoid swirls and it cleans out easily in the wash! Pickup your own DHydrate towel today! Restore your coating's brilliance and performance! CarPro Cquartz UK Edition 30 ml. New & Improved! CarPro Cquartz UK Edition 3.0 50 ml. CarPro ECH2O Waterless Wash & Quick Detail Spray Buy 3 - GET ONE FREE!